4 reasons to give the gift of subscription socks! This year, subscription boxes have taken off among consumers. There are subscriptions for all kinds of interests – books, magazines, clothing, games, makeup, and more – the list is endless. Here, we focus specifically on subscription socks for men and women. Clearly, based on the press that sock of the month clubs have received, the convenience of getting new socks each month makes it easy to keep a full and stylish sock drawer. 1. Subscription socks keep on giving! Who wants to give a boring, one-time gift anymore? The best part about signing up a friend or family member for a sock of the month club subscription is that they will receive the gift over the course of many months, and be delighted each time they receive a new set of socks. It’s a great way to extend out the value of your gift. 2. Sock of the month clubs are affordable gifts! 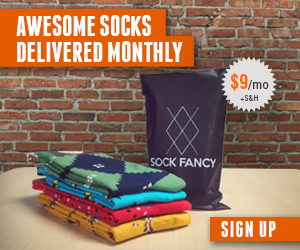 Most sock subscription sites are affordable. Ozone Socks subscription sock club gives you 40% off their sock retail prices. You are essentially buying in bulk but extending the receiving time out over many months. 3. Buying socks online is easy! Not everything can be bought online, especially in the clothing category. But socks? Super easy. There are not many sizes of socks – usually small, medium, and large. If you know what your recipient looks like, you can pretty much accurately guess the size of socks they’ll want to wear, and you never need to worry about fit! 4. There are dozens of styles of sock subscriptions! We’ve covered all sorts of sock subscription sites, but one thing we have definitely learned is that there are sock styles for everyone. If your gift recipient likes regular white socks, there are sites for you to buy athletic socks online. If your recipient tends to wear dress socks more often, there are plenty of dress sock subscriptions. And of course, the most popular set of socks is the whimsical fun sock subscription, which is the best way to spice up a sock drawer. So give the gift of socks this holiday season!